In the USA, 1 in 2 adults (or 65 million people) suffer from gum disease. The word periodontal literally means “around the tooth” (One more medical word of Greek origin). 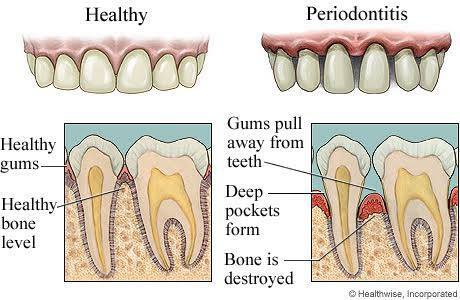 Periodontal disease is a chronic inflammatory disease that affects the gums and bone supporting the teeth. Periodontal disease can affect one tooth or many teeth. It begins when the bacteria in plaque (the sticky, colorless film that constantly forms on your teeth) causes the gums to become inflamed. Patient suffering from periodontal disease. The shape and position of her teeth has changed and she has lost several teeth. With time, plaque can spread and grow below the gum line. Toxins produced by the bacteria in plaque irritate the gums. The toxins stimulate a chronic inflammatory response in which the body in essence turns on itself, and the tissues and bone that support the teeth are broken down and destroyed. Gums separate from the teeth, forming pockets (spaces between the teeth and gums) that become infected. As the disease progresses, the pockets deepen and more gum tissue and bone are destroyed. Often, this destructive process has very mild symptoms. Eventually, teeth can become loose and may have to be removed. Chronic periodontitis results in inflammation within the supporting tissues of the teeth, progressive attachment and bone loss. This is the most frequently occurring form of periodontitis. It is prevalent in adults, but can occur at any age. Progression of attachment loss usually occurs slowly, but periods of rapid progression can occur. Periodontitis as a manifestation of systemic diseases often begins at a young age. Necrotizing periodontal disease is an infection most commonly observed in individuals with systemic conditions such as HIV infection, malnutrition and immunosuppression. Smoking is also known to have an additive effect on the progression of periodontal disease and be detrimental to healing after treatment. Research has also shown, that there is an association between periodontal disease and other chronic inflammatory conditions, such as diabetes, cardiovascular disease,osteoporosis and respiratory diseases. Therefore, it is very important to treat the inflammation that causes periodontal disease as soon as possible to ensure that your entire body stays healthy. Wash with mouthwash. Using a mouthwash can help reduce plaque and can remove remaining food particles that brushing and flossing missed. Get semi-annual check-ups and professional cleaning and scaling. Removing of tartar and bacteria from teeth and beneath gums and identifying symptoms of gum disease early are key to protecting your teeth and gums. Nonsurgical treatments can stabilize the condition of your gums but they cannot restore them to their previous condition. • Scaling: This is usually done in a standard professional teeth cleaning. • Root planing: Smoothing the root surfaces to discourage further buildup of tartar and bacterial toxins. • Antibiotics: May include topical antibiotics like mouth rinses and gels, or oral antibiotics. The patient pictured above after receiving periodontal and prosthetic treatment. A smile makeover that we are proud of and made her very happy. Ahead of any cosmetic makeover, we always recommend to my patients a comprehensive treatment of their gums. It might be a simple teeth cleaning or a periodontal treatment. 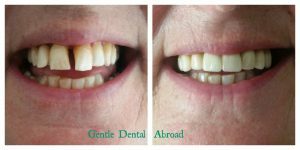 This is absolutely essential in order to provide the strong and healthy ground on which we will build a beautiful smile.